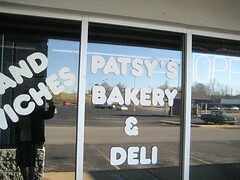 Patsy’s Bakery and Deli has apparently been around for YEARS. Long time. Seriously. Supposedly, both Patsy and her sister have been rockin’ the joint for a long time. So long that a friend of mine (who is SOOOOO OLD she’s thirty), apparently went to high school with Patsy’s sister. Or so the rumour goes. After an “intense” workout (ha!) in the Church Hill, TN community gym, it was time for some sweets at Patsy’s. Bought me some doughnut holes, and a slice of good ol’ Southern Red Velvet Cake. BEST. DOUGHNUT. HOLES. EVER. Seriously. Look at all that sugary-goodness dripping off. The golden sheen from the frying. Oh man. And best of all?! Totally dirt cheap. 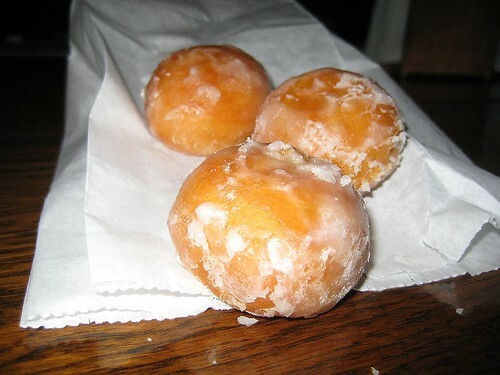 Seriously, I think it was like $2 for a dozen. YUM! 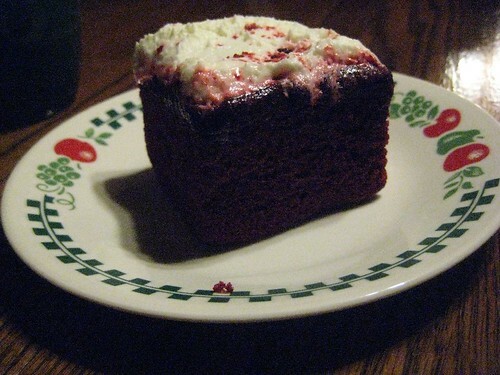 This is the red velvet cake from Patsy’s. Umm… I know the photo is bad, but really, I did all I could to make this look good. It was covered in a thick layer of plastic wrap, which messed up the frosting something fierce. A lot of frosting ended up on the plastic, and that’s a good thing! It was not good frosting. I don’t even know what it was. It wasn’t cream cheese, it wasn’t butter roux, it wasn’t buttercream… it wasn’t even Duncan Hines or Betty Crocker. It was this sloppy, sugary, oily…. thing. And the cake? Well… it was red. So, they got that part right. I think they may have forgotten the cocoa. At least the cake was moist, but that’s what happens when you encase something in a sarcophagus of plastic wrap. If, for whatever arbitrary reason, you find yourself in Church Hill, TN, you should hit up Patsy’s Bakery, but only for their doughnut holes. Maybe some of the other stuff in the case… maybe…. 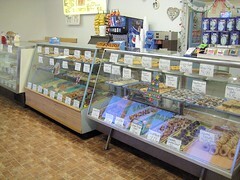 Contact Patsy’s Bakery and Deli at 423-357-8119. It is so hard to find a good red velvet cake!